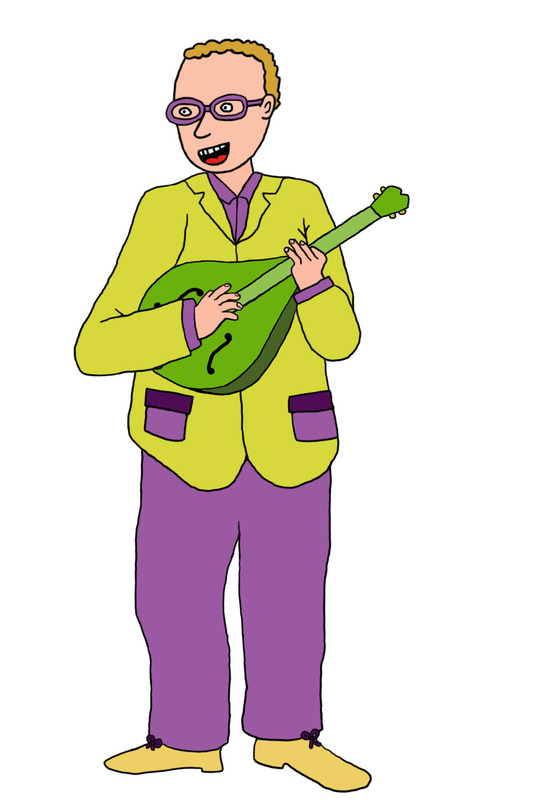 Here I have the final member of Tangleweed, Kip Rainey. I drew 9 heads for him since he is one of the vocalists for this song. I didn’t bother making more than one of each hand this time. For the first scene he’s in I’m doubtful that anyone will even really notice that he’s not really strumming. My boyfriend and I were watching Metalocolypse clips to see how they animate instrument playing. The animators for that cartoon let the hands stay still and the arm takes care of all of the movement. And I have a feeling that is how most animated cartoons are made…but if his scene was longer I would probably put more detail into it. Another band I would like to do an animation for is Tangleweed. They are a Chicago bluegrass band. I met the bass player when I worked at a coffee shop and I truly enjoy their music. They also hired me to create a couple coloring books for them (see my first blog post). The song that I am most drawn to is called “Mississippi Trashboat” and would love to work on that one. They do not have a video up for that song but it is from this album. Also, Mississippi Trashboat is based on a true story! A sample page of the Tangleweed coloring book I created.